The Republic of Crimea, a part of Ukraine, lies on a peninsula stretching out from the south of Ukraine between the Black Sea and the Sea of Azov. It is separated from Russia to the east by the narrow Kerch Strait. 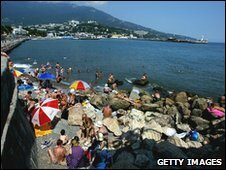 The Russian Tsars and Soviet elite spent summers on its subtropical southern shores which still attract holidaymakers and, latterly, wealthy property developers. Crimea was annexed by the Russian Empire during the reign of Catherine The Great in 1783 and remained part of Russia until 1954 when it was transferred to Ukraine under the then Soviet leader Nikita Khrushchev. Ethnic Russians still make up the bulk of the population, Ukrainians under a quarter and the Muslim Crimean Tatars about 12%. For centuries under Greek and Roman influence, Crimea in 1443 became the centre of a Tatar Khanate, which later became an Ottoman vassal state. Rival imperial ambitions in the mid 19th century led to the Crimean War when Britain and France, suspicious of Russian ambitions in the Balkans as the Ottoman Empire declined, sent troops. Given autonomous republic status within Russia after the Bolshevik revolution, Crimea was occupied by the Nazis in the early 1940s. The Tatars were accused of collaboration by Stalin and deported en masse to Central Asia and Siberia in 1944. Many did not survive. Only as the Soviet Union collapsed were they allowed to return. By the time over a quarter of a million did so in the early 1990s, it was to an independent Ukraine where they faced very high unemployment and extremely poor housing conditions. There have been persistent tensions and protests over land rights, and allocation of land to Crimean Tatars remains a highly contentious issue. After Ukrainian independence, political figures from the local Russian community sought to assert sovereignty and strengthen ties with Russia through a series of moves declared unconstitutional by Kiev. The 1996 Ukrainian constitution stipulated that Crimea would have autonomous republic status but reasserted that Crimean legislation must be in keeping with that of Ukraine. Crimea has its own parliament and government with powers over agriculture, public infrastructure and tourism. The Crimean Tatars have their own unofficial parliament, the Mejlis, which states its purpose as being to promote the rights and interests of the Crimean Tatars. The port of Sevastopol is a major naval base and has been home to the Black Sea Fleet since Soviet times. Following the collapse of the USSR, the fleet was divided up between Russia and Ukraine. The continuing presence of the Russian fleet in Sevastopol has been a focus of tension between Russia and Ukraine. 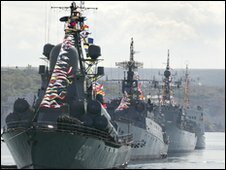 In 2008, Ukraine - then under the pro-Western President Viktor Yuschenko - demanded that Moscow not use the Black Sea Fleet during the its conflict with Georgia. There was also friction over plans - later scrapped by Mr Yanukovych - by Mr Yushchenko to strengthen ties with Nato. In 2006, ethnic Russians took to the streets to disrupt preparations for Nato-led naval exercises off Crimea. There is a rumbling border dispute between Moscow and Kiev in the Kerch Strait. Tensions rose sharply in late 2003 after Russia started building a causeway between the Russian coast and the island of Tuzla, just off Crimea. Volodymyr Konstantynov became chairman of the Crimean Supreme Council in March 2010, following the resignation of his predecessor, Anatoliy Hrytsenko. He was reappointed after regional election in November. The change come soon after the election of Viktor Yanukovych as Ukrainian president. Mr Yanukovych had promised to reorganise the leadership of the Crimean republic, and asked Mr Konstantynov and the new prime minister, Vasyl Dzharty, to carry out extensive reforms upon their appointment. The Crimean prime minister is appointed by the Crimean parliament with the approval of the Ukrainian president, and current President Viktor Yanukovych has taken the lead in actively nominating close political allies to key posts in the republic since taking office in 2010. His first prime minister in Crimea, Vasyl Dzharty, died of lung cancer in August 2011. President Yanukovych then nominated Anatoliy Mohylyov, Ukraine's outgoing interior minister, whom the Crimean parliament approved in November 2011. The appointment was controversial, as Russian-born Police General Mohylyov was chief of police in Crimea in 2007-2010 and angered civil-rights groups and Crimean Tatars with his tough stance on Tatar land protests. Since taking office he has pledged to cooperate with Tatar leaders. Also known as Mustafa Abdulcemil Qirimoglu Cemilev, the longstanding Crimean Tatar leader was born in 1943 and almost immediately sent with his family to Soviet Uzbekistan under Joseph Stalin's policy of deporting the Tatars. He was a prominent dissident in the 1980s, campaigning for the Tatars' right to return to Crimea, and was frequently imprisoned. Mr Jemilev founded the Crimean Tatar National Movement in 1989, and moved back to Crimea. His work in helping 250,000 Tatars return home was recognized by the UN with its Nansen Medal in 1998. He has led the Majlis, an unofficial body representing Tatar interests, since 1998, and seen off efforts by both Islamic extremists and Crimean Russian nationalists to undermine it. A supporter for Ukraine's Orange Revolution in 2004, he has also sat in the Ukrainian parliament as a ally of the future President Viktor Yushchenko since 1998. Rival media and their political backers compete for the attention of the peninsula's ethnic groups. Almost 100 broadcasters and around 1,200 publications are registered in Crimea, although no more than a few dozen operate or publish regularly. Outlets catering for the ethnic Russian majority dominate, supported by a mix of state and private funding. Crimea's ethnic Russians are also served by the main Moscow-based TV networks. Other broadcasters and publishers cater for the Ukrainian and Tatar minorities. There are no Ukrainian-only broadcasters operating from Crimean soil, but Ukrainian-language papers published elsewhere in Ukraine are available on the peninsula. Tatars too can choose from a range of outlets. Crimea's first Tatar-owned, Tatar-language TV launched in 2006. Russian gunboat diplomacy in Crimea?